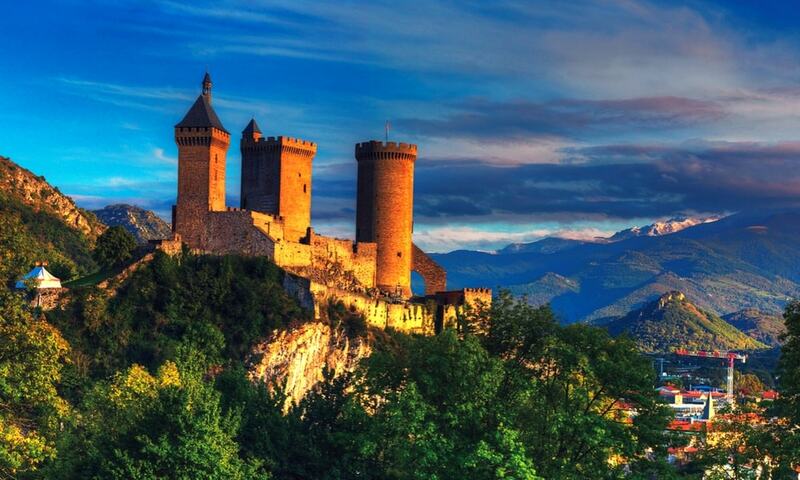 The Chateau de Foix is a genuine symbol of the medieval era which dominates the town of Foix. An important tourist site, it is known as a centre of the Cathars. Built in the style of a 7th-century fortification, the castle is known from 987. The castle allowed its occupants to control access to the upper Ariege valley and to keep surveillance from this strategic point over the lower land, protected behind impregnable walls. In 1034, the castle became capital of the County of Foix and played a decisive role in medieval military history. During the two following centuries, the castle was home to Counts with shining personalities who became the soul of the Occitan resistance during the crusade against the Albigensians. The county became a privileged refuge for persecuted Cathars. The castle, often besieged (notably by Simon de Montfort in 1211 and 1212), resisted assault and was only taken once, in 1486, thanks to treachery during the war between two branches of the Foix family. From the 14th century, the Counts of Foix spent less and less time in the uncomfortable castle, preferring the Governors' Palace. From 1479, the Counts of Foix became Kings of Navarre and the last of them, made Henri IV of France, annexed his Pyrrenean lands to France. As seat of the Governor of the Foix region from the 15th century, the castle continued to ensure the defence of the area, notably during the Wars of Religion. Alone of all the castles in the region, it was exempted from the destruction orders of Richelieu (1632-1638). Until the Revolution, the fortress remained a garrison but its life was brightened with grand receptions for its governors. Since 1930, the castle has housed the collections of the Ariege departemental museum. Sections on prehistory, Gallo-Roman and mediaeval archaeology tell the history of Ariege from ancient times.